Following the success of assault guns on the World War II Eastern Front, the Hungarians developed their own model, based on the chassis of the Turán tank. There were two designs, the 44M Zrínyi I, incorporated a long 43M 75mm gun, but it did not pass the prototype stage. The 40/43M Zrínyi II was armed with a 40M 105mm L/20 howitzer. It is nice to see some armor from someone other than the major players being kitted. Fine Molds has been pretty good with the Japanese subject and now with this release from Bronco, we get a Hungarian assault gun. Though it was dead end technology, I am a bit of a fan of this type of armor. It also bodes well for seeing the base tank being done sometime in the future. But enough of that. This is quite typical of Bronco's recent molds. 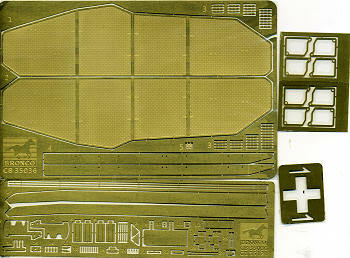 The detailing is very good and so we have a box full of primarily tan sprues along with several photo etch frets. Two of these frets are for the gun itself with the largest pieces being for the side screens. These are in a mesh pattern, something a bit different from what the Germans used in that they are not solid. To go along with that, we have an etched stencil to use on one of the markings options to spray the tank insignia and number on it. The other small fret is the central reinforcement for jerry cans as the kit includes several of these along with a pair of 200 liter drums. There is a very complete main gun that is able to be shown either extended or in recoil. The gun can be elevated as well moved a small amount in azimuth. There are optional forward mantlets for the vehicle but the instructions do not state which is used for which option. A full driver's compartment goes in the forward section of the full hull. While there is nothing else in the hull (no engine for example), since one can pose the engine covers open, one thinks that perhaps this will be available separately for those who want one. The suspension is quite detailed and thanks to the individual track links, will make up a goodly percentage of the parts count and the construction. The upper bodywork is a large single piece on which a lot of bits and pieces are attached. You will need to remove some bits and fill in some holes during construction to properly portray this vehicle. 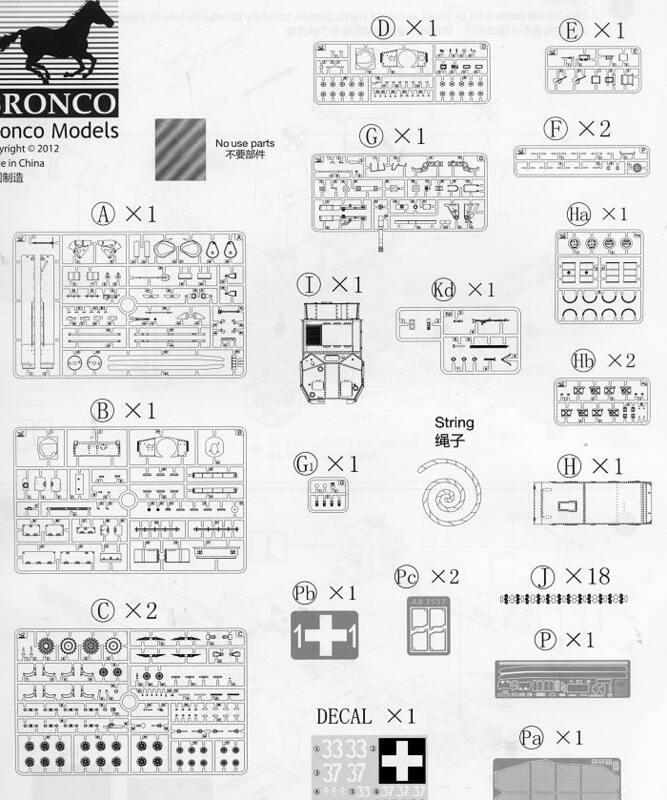 Similar to other Bronco kits, there are areas that will need to have bolt heads attached, and these are to be found on the sprues for you to remove and install on the kit. I should mention that not all of the marking options will need the side screens so there is a separate construction area for the installation of the mounting brackets and screens. There are three markings options, all with the 1st Assault gun Battalion. First is white 33 that is without the side screens and attached to the 1st Battery. Next is one with screens and the one that requires the stencil. It is attached to the 3rd Battery. Both of these are in overall olive green. The third option is also attached to the 3rd Battery. This is in a a mix of olive green, dark yellow and a reddish brown. This scheme extends to the side screens. The decal sheet is well printed and provides the markings needed for the three options. Instructions are superbly drawn and come in a slick paper book with color diagrams and a full color markings diagram. It is great to see these sorts of vehicles being kitted. 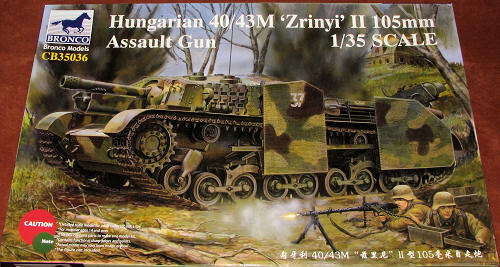 I do hope it sells well so that we can see other Hungarian armor pieces and perhaps some support vehicles in the near future. Definitely a nice change from the usual fare.